There are any news on this topic? There is a chance to see in future also the support for WP in the GLBasic? 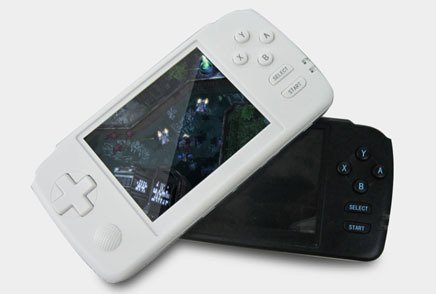 Jay Barwick has founded a new company that currently are developing a new portable gaming console. In the video is also mentioned the possibility for developers to request a prototype 'discounted' to develop on this console. Can be this a chance to port GLBasic also on this console? Is it possible to have a version for Caanoo? Or you think is it possible to have the source code as a tutorial? I corrected some translations to properly display in the graphics. Now it looks perfect . Hi, I have finished the Italian translation! If some Italian user found errors, they can correct it! Now I'm trying the translations in the test project. I think that this conversion is intended to allow the reading of books direclty on eBook readers. Ok! Thank you for your answer. Now I proceed with the order of the updated version . I have bought all your books in February. Can you have a list of changes made ​​to the second edition? On the LULU site I saw that there are two versions of "GLBasic Programmers Reference Guide - Second Edition"
This can confuses the buyers (in the preview I saw that the second link is the revision 4.0.0.1 and the first is the revision 4.0.0.2). I have not yet had time to read the first edition, think you that it is better to upgrade to the second edition? Do you think that is possible to have a discount code to purchase the second edition? Bad Behavior has blocked 7016 access attempts in the last 7 days.